If you own 2-in-1 Windows 10 device, like a Lenovo Yoga, rotation is one of the basic features that you’re going to use (or maybe you’ll want to disable it). Unfortunately, users have reported the Rotation Lock option is grayed out and that rotation isn’t working on their devices. In my case, my Lenovo Yoga 14 would auto-rotate without me putting it into tent or tablet mode which would then slow down the computer or move my desktop icons around. I actually wanted to enable rotation lock to prevent it from rotating, but mine was stuck allowing rotation. Some users are having the opposite issue, where they want their device to rotate but the rotation lock is stuck not allowing rotation. The fix for me was to put my 2-in-1 laptop into tent mode, which kept the device in landscape view except flipped. Once I did this, I was able to click on the Action Center and the Rotation Lock button was clickable. Once I selected Rotation Lock, it was locked in the flipped landscape mode even after I put the laptop back into laptop mode. To fix this, I right-clicked on the desktop and went to Display Settings. Under Orientation, I changed Landscape (Flipped) to regular Landscape. If your device doesn’t auto-rotate into Landscape Flipped mode, you can try right-clicking on the desktop and went to Display Settings. Under Orientation, and change Landscape to Landscape (Flipped), then check your Rotation Lock button. Using the same steps as above, try using Portrait Mode instead of Landscape (Flipped) mode. When device turns off, hold Volume Up and Power button. Choose reset and save option and exit. After you’ve done that, Rotation Lock should now appear in Notification area, and it should work properly. 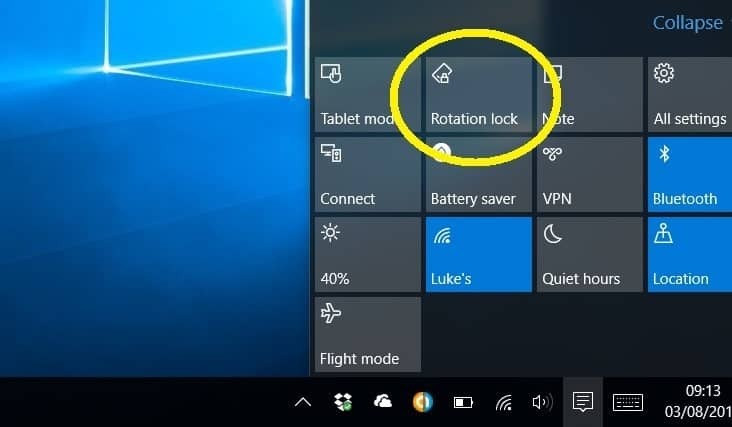 If Rotation Lock is grayed out on your Surface Pro 3 or Dell XPS 2-in-1 device (or similar device), you can try disconnecting your keyboard. Users have reported that after the keyboard is disconnected that the Rotation Lock button starts working normally. Click the Action Center button in the Taskbar. When Action Center opens, click the Tablet Mode. Open Settings > System > Tablet Mode. Make sure that Make Windows more touch-friendly when using your device as a tablet is turned On. Press Windows Key + R and type regedit. Press Enter or click OK. In the right pane, find LastOrientation and double click it. In Value data box enter 0 and click OK to save changes. If you see SensorPresent DWORD available, double click it and make sure that it’s value is set to 1. Press Windows Key + R and type services.msc. Press Enter or click OK. When Services window opens, locate Sensor Monitoring Service and double click it. Change the Startup type to Automatic and click Start to start the service. Double click the service to open its properties and set Startup type to Disabled. Open Device Manager. You can open Device Manager by pressing Windows Key + X and choosing Device Manager from the list. Once Device Manager opens, locate Intel Virtual Buttons driver. Thanks a lot for your great assistance. The option #9 works on my laptop which is Inspiron 15 5579 2-in-1. Kudos! I just want to state that I tried all of these things and none of them worked. I also tried all of the things listed on this site as well (https://windowsreport.com/rotation-lock-grayed-windows-10/) and none of those worked either. HOWEVER, I want to state that I DID FIX this issue myself after looking through all of my apps on my new ASUS Q534UX (Windows 10) 2-in-1 laptop. My Asus came with an app that was already installed – it was called “ASUS Fliplock.” After trying everything else, including resetting my PC (which deleted programs I already installed), I decided to DELETE THIS APP called ASUS Fliplock from my laptop. As soon as I deleted it, my “Rotation lock” button worked and I could turn it On and Off several times, even after restarting my computer. Worked like a charm! Thank God I have some common sense when it comes to computers.